The day after publicly apologizing over a racially-charged college-era photo, Virginia Governor Ralph Northam says he is not either of the men shown. “I believe now and then that I am not either of the people in this photo. This was not me in that picture. That was not Ralph Northam,” the Governor told reporters. 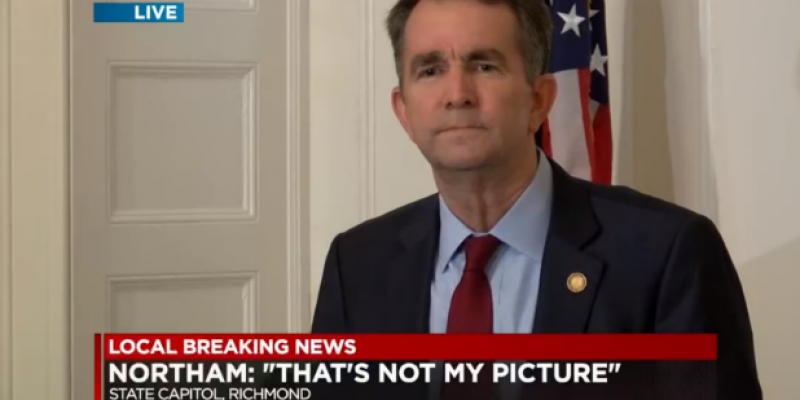 After first apologizing, and appearing to accept wrongdoing, Governor Northam now claims that he is neither of the men depicted in the “clearly racist” yearbook photo. More importantly, he is defying the loud and numerous calls for his immediate resignation, many which come from his own party. Instead, he decided to tell a story about another time that same year that he did, in fact, dress up in blackface for a dance competition.. which he won. “You said it was a dance competition? [Sic] And you danced the moonwalk? Are you still able to moonwalk?”, a reporter asked Northam. It was at that moment that the First Lady of Virginia stole a precious moment of comic relief from America in order to save her husband from himself. “I dressed up in a um, what’s his name? Michael Jackson. I had the shoes, I had the glove, I used a little bit of shoe polish to put on my cheeks,” Northam said. Next Article Trump Predicts Patriots Win Super Bowl, Names Brady G.O.A.T.